With veterans scheduled to report Thursday to Raiders training camp in Napa, the franchise kicks off what it hopes will be a breakthrough season. 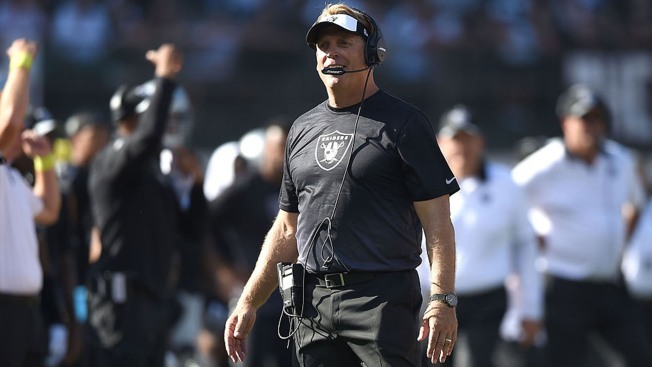 After advancing to 7-9 in 2015 under first-year head coach Jack Del Rio from the 3-13 record of 2014, the Raiders have been tagged by many national analysts as a contender in the AFC West and a possible playoff team for the first time since the 2002 season. This week, Sports Illustrated’s Don Banks predicted Oakland will break its long playoff drought. But Raiders head coach Jack Del Rio is trying to pump the brakes on all the playoff talk right now as he welcomes his veterans back to begin their 2016 quest. He wants to see how hard his team will work this summer to improve from last season. Rookies, quarterbacks and returning injured players have been at the Raiders’ Napa training facility since Sunday. The first full practice is set for Friday, with the first exhibition game Aug. 12 vs. the Arizona Cardinals. Del Rio told Breer that this team will have to bond and form a winning chemistry while learning how to win. That, he said, is the key to going from 7-9 to a contending team.